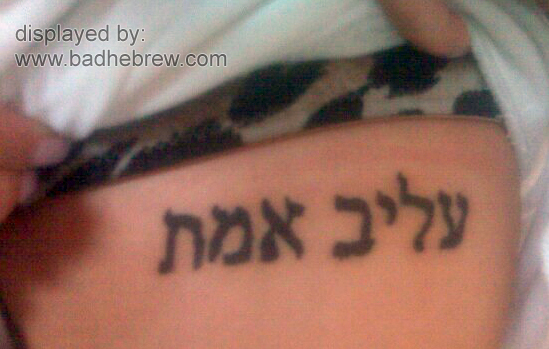 This lovely Hebrew tattoo, found and sent in by Ian, does not say "True Love", it doesn't mention love at all! Instead, it roughly says "Truly Insultable". Roughly, because Insultable isn't a real word in Hebrew either. The gust of it is unmistakable, though. "True Love" in Hebrew is "Ahavat Emet", while our victim's scribble reads "Aliv Emet". Love, Aliv, kind of sounds similar. Could it be some strange transliteration mistake? We'll probably never know. It's always difficult to photograph a tattoo. In this case we don't see the complete message: "Met al'ai, B'emet" ('Crazy about me, really') which would help the whole story to be understandable. Unless there's a question-mark after the phrase. Heh. A bit of letter shuffling, and an extra word that must be hiding there somewhere, and it totally makes sense..
Yonatan, I've missed you :) The site just isn't the same without your comments! Not to hijack the comments thread, but I've got a question for Typo Tat. Where could I find the exact font or script you're using for those sample gif's? That's the best looking script I've been able to find, and I'd love to use it for the tattoo I'm wanting to get. Thanks to the errors and corrections on this site I've been highly motived to do lots of research, and I've got my translation 100% accurate. Even got the seal of approval from a young boy at a movie theatre who read the test Henna tattoo I did and was glad to hear I knew what it meant. I think ahava amiti might be better. Ahavat emet means love of truth, strictly speaking. @chinick - It can mean either True Love or Love of Truth, depending on the context. It's a very common way to write True Love in modern Hebrew, though, no one will be confused by it. Do not write Ahava Amiti - Love (Ahava) is a she, so the correct form would be Ahava Amitit - Real Love. I'm starting to get tired of this argument. You don't have to take my word for it, it's a widely popular expression, Google it and see what comes up.